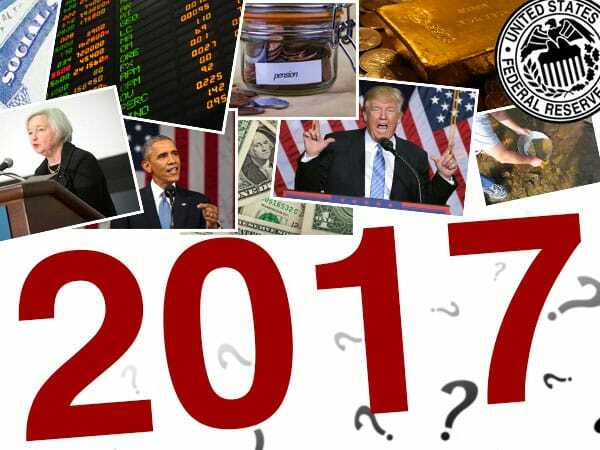 2016 was a year of big surprises: Britain’s exit from the Eurozone, Donald Trump’s entrance to the White House, the Federal Reserve’s new interest rate strategy, and much more. Meanwhile, precious metals markets grew increasingly bullish, fueled by the past year’s extreme volatility. Donald Trump’s presidency could be a strong driving force behind a rise in gold prices in 2017. Analysts predict that his big plans for spending – nearly $1 trillion on infrastructure alone – could trigger an increase in inflation, which in turn could send Americans running to gold for wealth preservation. If Trump is successful in achieving his goals for fiscal spending, which Alex Merk, CIO of Merk Investments, says he likely will be, gold will be poised to take off in 2017. It wasn’t a big surprise when the Federal Reserve announced a quarter-point increase in rates earlier this month. But the accompanying news of the Fed’s plans for three more rate hikes in 2017 was a little surprising. After almost a decade of near-zero rates, this marks a major turning point in Fed policy. But it’s also a double-edged sword. It’s necessary to work rates up to strengthen the economy and move it back toward a state of relative normalcy. But there could still be some nasty bumps along the way. Higher rates mean less lending and fewer Americans buying homes, cars, and other items traditionally purchased on credit. Further, the economic contraction that could be caused by higher rates may also trigger a pullback in markets across the board — and there’s essentially no way to prevent that from happening. However, there is an upside to all this. Gold typically reacts inversely to the market at large, which means any downward thrust in the markets caused by higher rates would most likely push gold higher. Anyone watching the smart money in 2016 saw it make a major inflow into gold. Some of the world’s richest and most knowledgeable investors flocked to gold, and there are several reasons why. Back in August, Jacob Rothschild said the global economy was entering “uncharted waters,” and that the Rothschild Investment Trust would be reducing its equity holdings and increasing its positions in gold dramatically. Then in early November, we learned that the upper class had been rushing into gold as fast as they could. They’ve begun to fear the consequences behind years of stifled interest rates, and they started buying up pseudo-real assets like fine art and collectibles as a hedge. But after many were burned by those investments, some are moving on to more legitimate real assets like gold. All this influx of money into the gold market over 2016 may very well ramp up in the new year. And if it does, the real question will be by how much. In the past few months, the stock market has doubled down on its rally and continued to soar higher. But how sure can we be that a crash just as strong isn’t right around the corner? As we discussed earlier this month, corporate buybacks appear to be propping up the stock market and giving Americans false hope. When the phony buyback boost runs out of steam, what will there be to keep the market from toppling? Plus, we can expect to see a “rotation out of domestic U.S. equities” starting in January that Credit Suisse’s Victor Lin says could be the “largest on record,” due to pension rebalancing in response to the recent rise in stocks. Ultimately, there are more things working against the current market rally than there are things working for it. It would be no surprise if we saw a reversal sometime in early 2017. And if that reversal arrives, it would almost certainly act as yet another catalyst for rising gold prices. There are many factors set to benefit gold moving into the new year – even more than we could list here. And don’t forget, gold has been a store of wealth of THOUSANDS OF YEARS, and it will continue to be desired as a store of wealth long after the U.S. dollar becomes extinct and many of our stocks become worthless. So if you need a good New Year’s Resolution, securing your wealth with gold might be the perfect thing.